TechnoKids Inc. has just released TechnoStart, a technology project with computer activities for beginners. In this project, primary students have fun learning computer fundamentals. 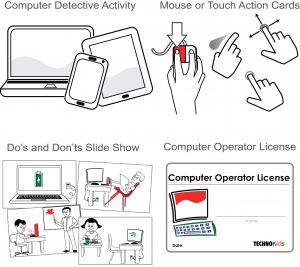 This introduction provides beginners with basic knowledge such as the function of computer hardware, mouse or touch terminology, and computer rules. Activities encourage students to discover how to create with technology. 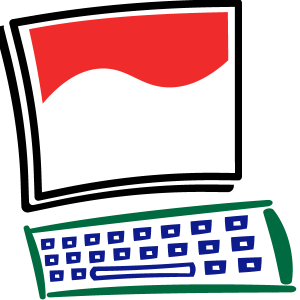 By making simple paintings they develop essential skills including how to open and close a program, select tools to perform a task, save and print, open a saved file, and type using the keyboard. 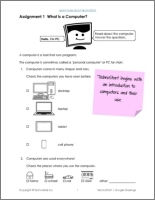 Upon completion, students receive a Computer Operator License that states they can use the computer competently and safely. Extension activities introduce sign in and out procedures, file organization, and painting techniques. TechnoStart is a new project by TechnoKids Inc.
TechnoStart engages young learners. Worksheets and fun painting activities provide a foundation for future learning. Lessons are for Google Apps and Windows users. Activities are designed specifically for beginners. Want to know more? Discover how TechnoStart can be used with your students.